A Path Begins (Book #1) by J.A. White. Katherine Tegen Books, 2015. Paperback. 512 pages. 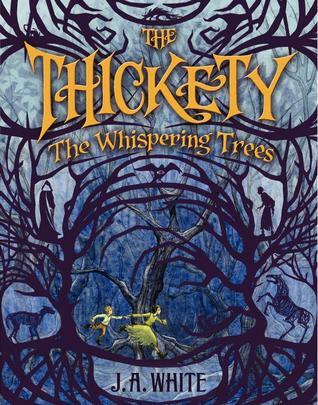 The Whispering Trees (Book #2) by J.A. White. Katherine Tegen Books, 2016. Paperback. 544 pages. As you may or may not know, I love to read middle grade books in addition to all of my regular 'adult' books. I think MG books can be incredibly clever, deep, and present new ideas and stories in unique and entertaining ways. 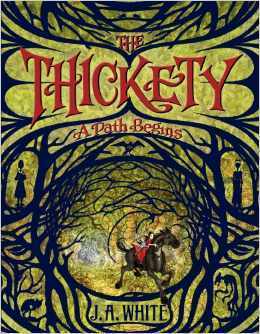 The Thickety series by J.A. White is one of my favorite middle grade series (Trenton Lee Stewart being one of my other favorites, in particular) and I really can't recommend it enough. I read these books a couple months ago, but I've been sitting on reviews for them ever since and wondering just how to form them into something adequate enough to share with all of you. These books are spooky, almost to the point where I started to think, "wait, is this really middle grade!?" And this is why I also say not to underestimate books marketed for younger readers. There are obviously spooky aspects of the book (the haunted woods, witches, etc. ), but there are also much deeper, creepier ideas and events that occur as well. The first book, A Path Begins, takes place mostly in the town, and the second book, The Whispering Trees, actually takes readers into the Thickety itself, which is full of endless traps and terrors. There are weird, crazy creatures, haunting settings, and a slew of other magical elements incorporated in these books. The magic that is used in this book comes from a grimoire that can only be used by witches. This magic is not simply a power that can be used, it is more of a give-and-take situation in which sure, you can use spells, but every time you use that power, a small piece of you is also taken. It's nothing noticeable or tangible, but if you use up all of the pages of the grimoire, you may just lose yourself in the process. I won't go into much more detail than that, but suffice to say... it's an interesting concept. Grief also casts quite an umbrella over many parts of both novels, and I think White really did a wonderful job portraying how it affects people in different ways, and particularly how Kara, our protagonist, managed to find her own grief and ability to comfort those around her. White managed to develop extremely strong characters that felt very authentic and three-dimensional. There was so much to each person that allowed them to stand out and also transform according to what events occurred in the book. Kara herself is an extremely dynamic character who carries many burdens throughout her journeys in these books, and she is a character that I really liked and admired. There are moments in which she struggles to do what is right and maintain her goodness, but her strength shines in these moments. Even the villains in these books are well-rounded and fully fleshed out. In the first book, Grace is one of our main villains, and although she at first appears to be your typical 'mean girl' that bullies Kara in school, it eventually becomes apparent that there is much more to Grace than meets the eye. In addition to the characters, White also plays with the issue of how fear and the unknown can impact the mentality of a large group of people, leading them to treat people wrong and do things to them that aren't right or justified in any manner. These books are intense, but totally worth it. The most prominent and (to me, at least) interesting parts of these novels is the focus on humanity and what it means to have compassion, to yearn for something more, to have power and how to know when its too much, and--most importantly--to remember who we are and who we are meant to be as humans. If you're someone who is thinking of picking this up for a kid in your life, you might want to make sure they can handle things on the darker side. If so, then it's a great book to introduce a lot of important themes and discussions about many different aspects of life and relationships among people. Overall, I've given both books five stars and I look forward to diving into the rest of this series!